We’d love your help. Let us know what’s wrong with this preview of The First World War Galleries by Paul Cornish. World War I continues to be remembered as one of the most horrific confrontations in human history, as the combination of trench warfare and modern munitions claimed the lives of 16 million soldiers and civilians with many more wounded or missing. But the effects of war reached far beyond the battlefields. One hundred years later, changes it wrought to the world’s cultural World War I continues to be remembered as one of the most horrific confrontations in human history, as the combination of trench warfare and modern munitions claimed the lives of 16 million soldiers and civilians with many more wounded or missing. But the effects of war reached far beyond the battlefields. One hundred years later, changes it wrought to the world’s cultural and political landscape continue to shape lives. 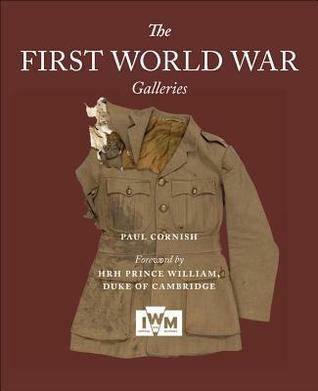 Paul Cornish’s The First World War Galleries revisits this historic event on the occasion of the centenary of its onset, drawing on the unparalleled archives of the Imperial War Museum. Founded in 1917, the museum has as one of its missions the collection of items related to the war, and it opened to the public in 1920 with a wide range of materials, including film footage, oral histories, photographs, works of art, personal correspondence and diaries, and artifacts from machine guns to military vehicles. As curator of the museum’s forthcoming First World War Gallery, a major new project planned for the centenary, Cornish emulates the exhibition’s accessible approach to offer a carefully researched and compelling account of this crucial period of world history. To show why this tragedy occurred, Cornish traces the war’s roots to 1900, carrying his narrative through to the close of the war in1918 and its consequences into the 1920s, overturning a great many myths along the way. To ask other readers questions about The First World War Galleries, please sign up. A good entry level overview of all things WW1 and nicely produced. As it is attached to the exhibition galleries at the Imperial War Museum I was expecting more on the objects in terms of more pics and also a bigger insight into them.